Hos Dorte: Happy Easter, a reminder for HM&FMC. Hi Dot, love how you combined these images. That poor bull bellied mouse is going to get a big surprise! Those cupcake papers are so sweet. Your niece is going to love this one. A beautiful card with such a fun image! I love the papers you've used with it too. Absolutely adorable! 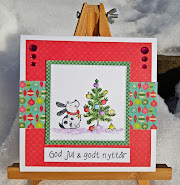 A gorgeous card Dot, a lovely design with super colours and papers............your image is beautiful who is about to woken up!! LOL! I think this is such a fun and cute image. I love that the mouse has fallen asleep in the cake. Thanks so much for playing along with us at Cupcake Inspirations this week! Deborah, DT. Aww so cute. 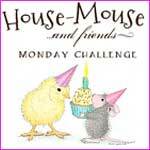 I love House Mouse images. Thank you for joining our challenge at Cupcake Inspirations this week. Oh my, I LOVE your little mice...so sweet! Coloring is amazing!!! Thanks for playing with us over at Cupcake Inspirations! Very pretty card, I bet your niece loved it! Thank you for joining in our challenge over at Gruffies & Guests. Angela (DT).